The organization is being displaced, but its members remain optimistic. 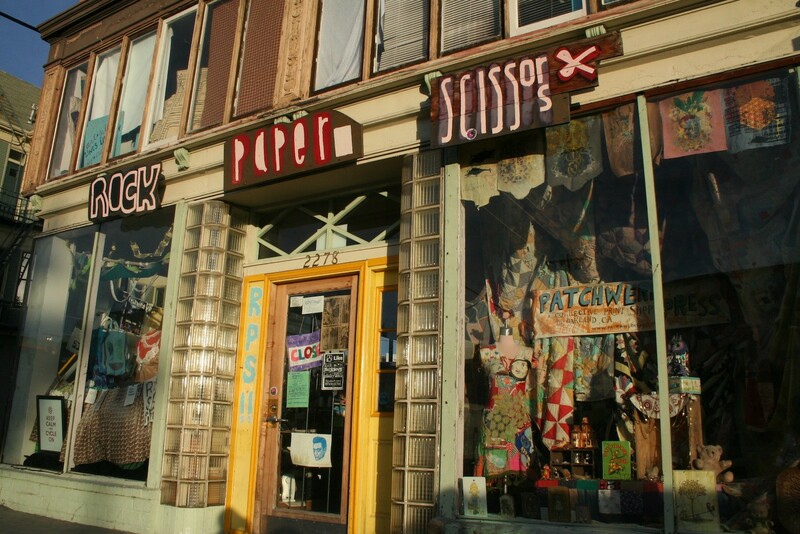 A couple weeks ago, Rock Paper Scissors Collective, a volunteer-run community arts organization that has inhabited the conspicuous corner of Telegraph Avenue and 23rd Street for the past eleven years, received a letter in the mail from its landlord. After years of working with the organization to keep its rent affordable, the building owner has decided to more than triple the rent, bringing it up to market rate. RPS (the acronym by which the organization is often lovingly referred) must be out of the building by August 31st. Kristi Holohan, one of five directing members of RPS, was devastated when she heard the news. But instead of wallowing, she went out that same day and bought herself a suit. RPS members are hoping that they can turn the unfortunate circumstances into an opportunity for expansion. But for that to happen, they need all the support they can get — possibly including financial support from foundations with fancy offices where people wear business attire. "Sure, I'm an artist, but I can play dress up," said Holohan in a recent interview. She isn't wasting any time. Holohan's joking comment and resilient outlook is a reflection of the RPS spirit. Although the organization is an official nonprofit, it doesn't quite function like one. There's no office. Instead, the RPS space is an all-encompassing DIY community hub with an art gallery that features youth and other emerging artists, a boutique that sells local handmade goods on consignment, an extensive zine library, and space to hold DIY workshops. Run entirely off the commitment of its volunteers, it’s extremely personal, radically inclusive, and scrappy in every sense. When you have a wacky idea for a workshop, need a place to nurture a project, or have nowhere to go after school, RPS has long been a go-to resource. The collective is also a humble totem of the Oakland arts community. RPS was one of the founding members of Oakland Art Murmur in 2006 — when it was merely a small group of uptown gallerists that would meet periodically in the now-extinct Mama Buzz café and gallery. Now, as everyone in Oakland is keenly aware, Art Murmur has grown into an internationally recognized collective of 45 galleries that span the Town and is often credited for putting Oakland's art scene on the proverbial map. Despite Art Murmur's success, RPS is the only founding member that still exists. For that reason, it’s become symbolic of the origins of the now burgeoning uptown art district — arguably the only remaining space in the area that refuses to conform to the standards and values of commercial galleries. So, the news that RPS will no longer be in the neighborhood is, for many people, a disheartening seal of fate. It’s the ultimate evidence of the cycle of seemingly inevitable displacement in which art spaces contribute to the value of a neighborhood and then get priced out in large part because of the hard work that they put into invigorating it. RPS was already facing financial hardship over the past year due to a lawsuit (that it eventually won). Because its member volunteers were focused on fighting that battle, they missed crucial grant cycles. To make up for that loss, the collective ran a crowdfunding campaign in February and were able to raise nearly $10,000, although it didn't reach its goal of $25,000. The collective was informed months ago that the rent for its space was going to be raised, and its members were bracing themselves for the finalized rate. Their intended plan was to partner with other organizations to help pay for the space. “We were gonna look at working more concretely with other groups as creating a hub and cultural center for teen service provider groups that work within the creative realm,” said Holohan. But when the letter from the landlord arrived, there was no option to renew the lease. Despite the unfortunate circumstances, Holohan and the other RPS members are determined to stay positive and view the move as an opportunity. “I was really sad when I found out. I was super super sad," said Holohan. "But I'm like, I cant live in that nor can I focus on the negative effects of gentrification, but what I can do is be like you know what … how do we use this as an opportunity to catapult into something strong?” RPS has reached out to its community and board members to help brainstorm a variety of potential next steps. “We’re trying to think about every option right now, ” said Holohan. The ideal option that RPS members are considering is to move into an 8,000-square-foot warehouse in East Oakland. If they get the spot, it will accommodate a performance space, an art gallery, art studios, a workshop for making bikes, a commercial kitchen for culinary classes and room for other organizations to partner with them. Another option is to share another organization's existing space. But RPS has already reached out to the Omni Commons and determined that even a space of that size couldn't fully accommodate all of the facets of its programming. Ultimately, RPS may have to “explode” for a bit, put its things into storage, and host pop-up events in parks and other venues, until it can find a new home. The collective is being fiercely optimistic and flexible, but there are also a few things that its members feel strongly about prioritizing. One of those is accessibility, especially in respect to public transportation. A lot of the youth that attend programs and workshops in the space come from East Oakland, and take the 1R bus — which stops down the block — to get there. That accessibility is key for the organization. After RPS finds a new home, financing the space will be the next hurdle. Holohan said that crowdfunding likely won’t be the collective's strategy, because it's such a "hyper local" organization that its members are skeptical about that being the most effective mode of fundraising — plus, members of the demographic that it serves often can't contribute financially. So, that's where Holohan's new suit — and grant-writing experience — will have to come in handy.